"I know new media art when I see it." Museum curators often frame new media art in modernist terms that attempt to provide easy and familiar rules for institutional inclusion or exclusion. Yet while many emerging participatory mapping projects can be experienced at art festivals such as Transmediale, ISEA, and Ars Electronica, when it comes to more traditional art institutions their validity as art is often questioned. Emerging art needs new venues and old venues need a new definition of art. I had been toying with the idea of a podcast when Robbin Murphy came back into New York to start upgrading The Thing’s web portal post.thing.net. Rob & I and Adrianne Wortzel were doing Art Dirt in the 90’s out of Pseudo as a webcast. Rob & I thought it would be interesting to do an “on location” Art Dirt podcast. Thus the name Art Dirt Redux. The original Art Dirt was a round table talk show that began as one of the first audio webcasts and later was upgraded to streaming video. Pseudo’s head Josh Harris was a visionary and had the idea of setting up a media outlet using the internet that would compete with broadcast and cable TV. The programs on pseudo were structured like mass media programs with commercial breaks. 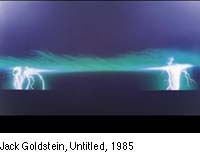 The ghost of Jack Goldstein is haunting New York right now with films, records and paintings at Mitchell-Innes & Nash uptown and paintings from the early '80s at Metro Pictures in Chelsea. His suicide two years ago went practically unnoticed by a contemporary art world deep in debt to him (details: here). Join us for an intensive one day conference about new media education. Connect with new media researchers and educators, present and discuss, and exchange syllabi or other public domain materials in a temporary gift economy zone. Bring your USB memory key and laptop. primary element of the compound. the venture, participation is restricted to men. Rudolf Frieling and Dieter Daniels (eds. ), commissioned by Goethe-Institut and ZKM Center for Art and Media Karlsruhe, Springer Wien/New York 2005, Text: German/English, 320 pages, hard cover. Key topics include: Sound and Image, Cyborg Bodies, Photo/Byte, Generative Tools, Art and Cinematography, Mapping and Text and Public Sphere_s with texts from Inke Arns, Josephine Bosma, Dieter Daniels, Steve Dietz, Rudolf Frieling, Susanne Holschbach, Tjark Ihmels/Julia Riedel, Verena Kuni, Gregor Stemmrich and Yvonne Volkart. NEW YORK, May 2 /PRNewswire-FirstCall/ -- SIRIUS Satellite Radio (Nasdaq: SIRI - News) and PodShow.com announced today that Adam Curry, the "father of podcasting," will produce a special SIRIUS Satellite Radio program which will broadcast the best podcasts in the world exclusively to SIRIUS subscribers.